Two updates. Larry Grace introduced his Dr. Stump out of M.D.B.S. this year. Gerda has also introduced her very fine Victorian Gardens Baby Shiners last year out of M.D.B.S. Gerda Brooker introduced MALCOLM DAVID BROOKER SENIOR in 2007. 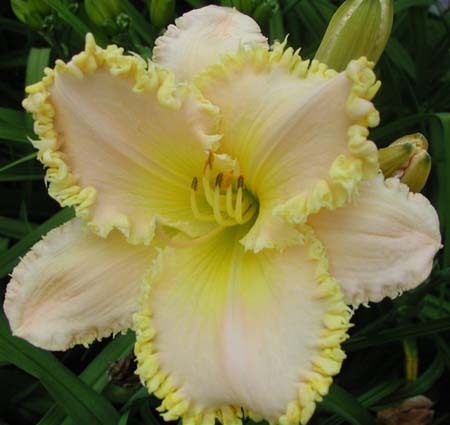 Her late husband Malcolm hybridized the daylily. The cross is (FORESTLAKE RAGAMUFFIN x T.HL 16). T.H.L. 16 is a seedling that Malcolm acquired from Larry Grace. The seedling is a cross of (Tetra Helena Louisa x Larry Grace). I’ve seen MALCOLM BROOKER SENIOR grown in several gardens from Alabama to Kentucky to our Ohio garden. In each garden, the daylily is special. It consistently displays a toothy edge on both the petals and sepals. The daylily is sunfast and looks grand in a clump. I’ve seen several seedlings out of MALCOLM DAVID BROOKER SENIOR that have been outstanding. The teeth on the sepals is passed onto the children. The children have a clear color with smooth substance. If you use MALCOLM DAVID BROOKER SENIOR , it should work with any color. One more thing, M.D.B.S. is registered at 6 inches but Gerda says it is 6.5 to 7 inches on her website. That makes M.D.B.S. one of the largest pastel round toothy daylilies you can use in your own hybridizing. This entry was posted in Daylily Hybridizing and tagged daylily, daylily blog, DR. STUMP, MALCOLM DAVID BROOKER SENIOR, Victorian Gardens Baby Shiners. Bookmark the permalink.